Bay Street, the financial district, downtown Toronto. 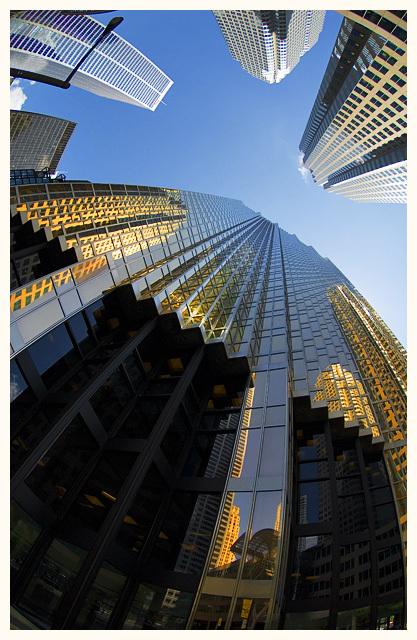 The title comes from a book written in 1982 by Walter Stewart about the Canadian banking industry. Hue/Sat, Curves, Smart Sharpen, Shadow/Highlight. ouffff woow very cool effect ! Message edited by author 2007-03-08 17:42:53. A well-deserved ribbon. This is one of the best of its kind IMHO. The fish-eye was a good choice of lens. The colors and composition are magnificent. Great use of the fisheye on one of my favorite streets in one of my favorite cities. Congrats on the Louis. First of many I expect. A fine example of how clean a low-resolution shot can be and what point of view can do in a shot! Congrats on your first ribbon with this intriguingly curvilinear study. Congratulations on your first ribbon. Excellent shot! So I didn't have to go far to find yours in this contest. Congrats, dude! Ribbon #1 of many more to follow, I'm sure! What makes the shot (and I'm sure you already know this) is the gold. It's still be good shot without it, but not as good. Nice use of the ol' fisheye - you're having fun with that, aren't you? Congrats again! Great picture, great finish. all i can come up with is *WOW*, and i don't even like toronto, which makes this an extra special "wow"... Good job on placement!!!! Congratulations on your first ribbon Louis! Well deserved, this is truly an amazing shot! Congrats on your first ribbon! A well-deserved yellow :) ...and on you're 12th shot too! Nicely done! Awesome ! Congrats on your ribbon ! Congrats on your first ribbon !!! Really nice work...congrats on your ribbon! A perfect use of this lens in strong, effective light. Classy Louis. Nice and clean and strongly meets the challenge. Big congrats on your RIBBON. Congrats on that first ribbon. I so need a fisheye! I knew this would do well ;-) Congratulations on your yellow ribbon. Way to go Louis! Congrats on your ribbon! Beautiful. Fantastic colours and great composition. This will undoubtedly do well. imo, this should do very well. i...love...fisheye. great use of it. This is awesome. I love that angle and the reflection of the other buildings in the glass. Great job. In that case...look out below! I love the reflections...nice and crisp. Interesting picture, interesting title. Love it! I love the colours and distortion. It's the only building picture that I've seen so far that's creative, and there are lots. Nice title and the image DOF is very pleasant. What with the reflections, I think you achieved a very good exposure. 8.
stunning. I want this lens! Proudly hosted by Sargasso Networks. Current Server Time: 04/21/2019 05:11:00 AM EDT.